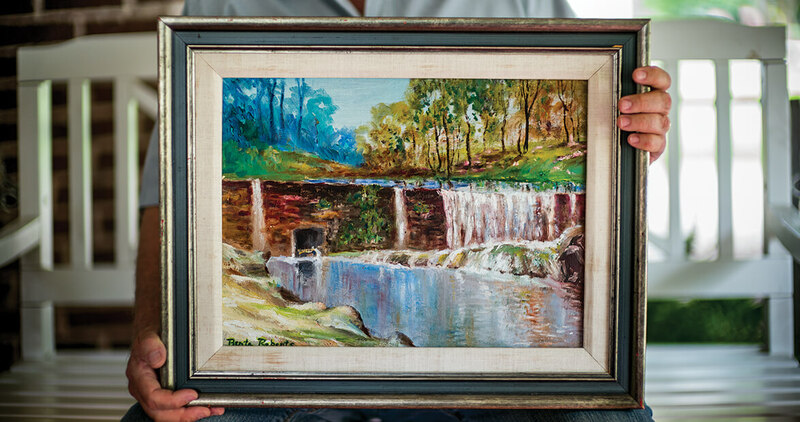 A grandmother’s depiction of a favorite swimming spot preserves a moment in shades of yesteryear. It’s a place and a painting and a story, the three of them wound together in the history of my family for so long that it’s hard to parse out where memory might end and myth might begin. The fact that the place is real and the story is true — and that the painting was destined to be mine since I was a child — makes it all the more powerful. Sometimes the truth of a story lies beyond its truthfulness. I can’t say when Bee painted the picture, but it must have been before the 1960s. In 1963, Bee and Papa — my grandfather — moved to Myrtle Beach, where, for years, Bee was a professional artist and writer. She painted large acrylics and oils, and her specialty was beaches with sweeps of rolling dunes. If you checked into a downtown Myrtle Beach hotel in the late 1960s or ’70s, it was a pretty good bet that one of Bee’s oversize ocean scenes hung behind the reception desk. As a child, I remember Bee painting blue hydrangeas and yellow jonquils and hibiscus blossoms. They were brilliantly colored and posed just so, nothing like the painting that meant the most to me. She painted the old mill dam in the colors of early fall. The water pours over the ancient fieldstone in three separate cataracts, the face of the dam grown over with mosses and shrubs. It’s a pastoral idyll, a moment in time at a place where human and natural history seem to accommodate one another. I’ve long figured that the painting, and the stories, and the generations-old memories played a role in my long love affair with old millponds. But there are millponds, and there are millponds. Prior to the Civil War, most mills, including Bailes’s, were grist and flour mills, small-scale operations where small-scale farmers brought their corn and wheat to be ground into grits, meal, and flour. In turn, these mills supported other local businesses that often cropped up within a corn cob’s throw: blacksmith and harness shops, taverns, tanyards, and country stores. These old gristmills were a sort of cultural commons, and they embodied a rural Carolina ethic: A yeoman farmer could, with hard work and the support of a community, raise a family on a small piece of land, and water the green shoots of self-reliance with the sweat of his brow. After the Civil War and the collapse of Southern agriculture, and with the rise of industrialism, a new kind of mill began transforming the North Carolina Piedmont. Large textile mills ushered in a new era, a new aesthetic, and a new way of organizing community life. These edifices of industry shaped the history and culture of rural North Carolina as surely as the old gristmills of yore. They seeded the landscape of the Piedmont and Coastal Plain with reservoirs, and mill villages where scores of textile workers lived. No longer symbols of independence, millponds in the manufacturing era were icons of a time gone by. But those old millponds, the grist and flour mill ponds, are still out there. Many times I’ve paddled the dark waters of Merchants Millpond in Gates County. Created in 1811, and now a state park, the pond sprawls across 760 acres of cypress swamp. It’s big water to cross with a canoe. Not so with most other millponds. In the rolling Piedmont, the land is steeper, and the millponds smaller. Robertson Millpond Preserve in eastern Wake County, built in the 1820s, covers 85 acres, which you can explore in a canoe or kayak in a single, unforgettable afternoon. Many smaller millponds are private, visible only as you pass by in a car, hinted at by names on the road signs: Gooch’s Mill Road, Laurel Mill Road. In Wake County alone, 70 small millponds once drove industry. Only one, Yates Mill, is still active. And, of course, there’s Bailes Old Mill. Bee’s millpond. It’s amazing that the dam still stands, that the mill has been preserved and restored, that the wheel still turns and grinds. These days, old gristmills are mostly gone forever, and they live only in memories that bubble up to the surface when you catch a glimpse of a stone dam holding back a quiet platter of still water, or hear a child splash in a pond. 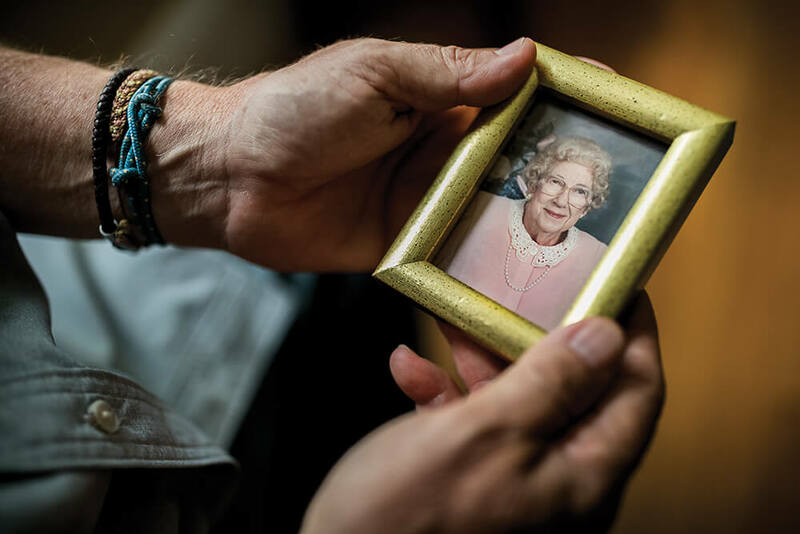 But for a lucky few of us, in my family, we only have to turn a corner in a hallway, and sunlight on the water of a painting on the wall brings back memories of a place, and a time, and a sweet woman with an eye for the things that endure.